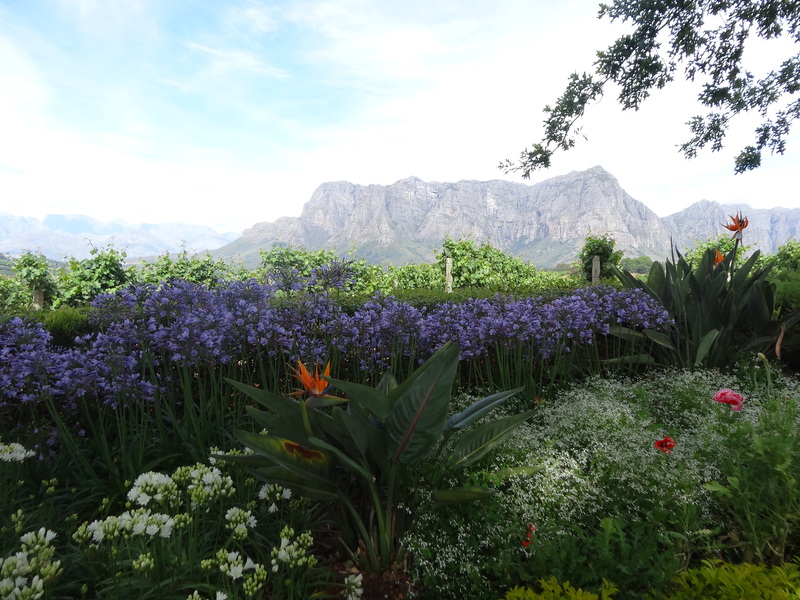 Delaire Graff , a stunning wine estate garden. ← Monet’s garden at Giverny. Over the years, when visiting one of our favourite wine estates,Thelema, in the Cape region, it was clear major ground works were going on in the estate across the road. Massive bouldered retaining walls emerged like the fabled Hanging Gardens. The stunning beauty of the Helshoogte Pass, Cape wine region. 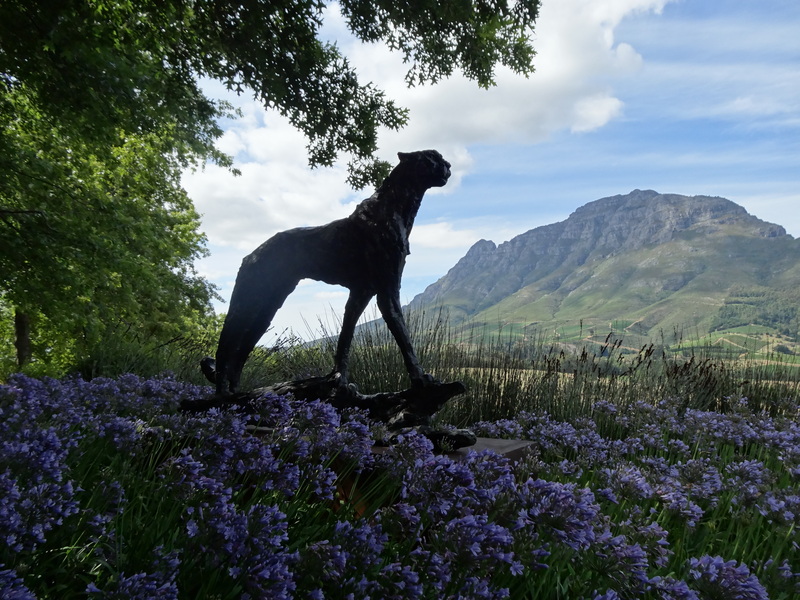 The estate was Delaire, formerly home to the Platters who wrote the respected Wine Guide, and purchased in 2003 by Laurence Graff, Chairman of Graff Diamonds Int. 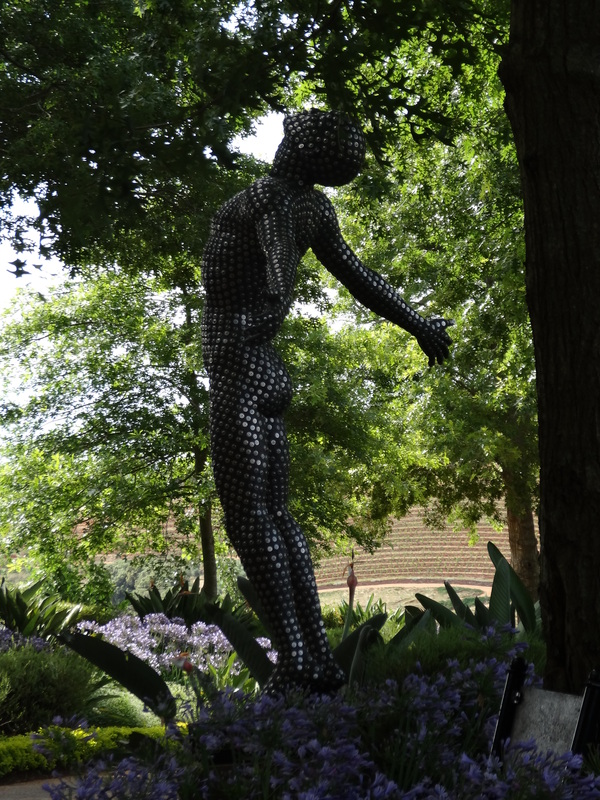 who envisioned creating great wines, a great restaurant and a great garden full of sculptures. 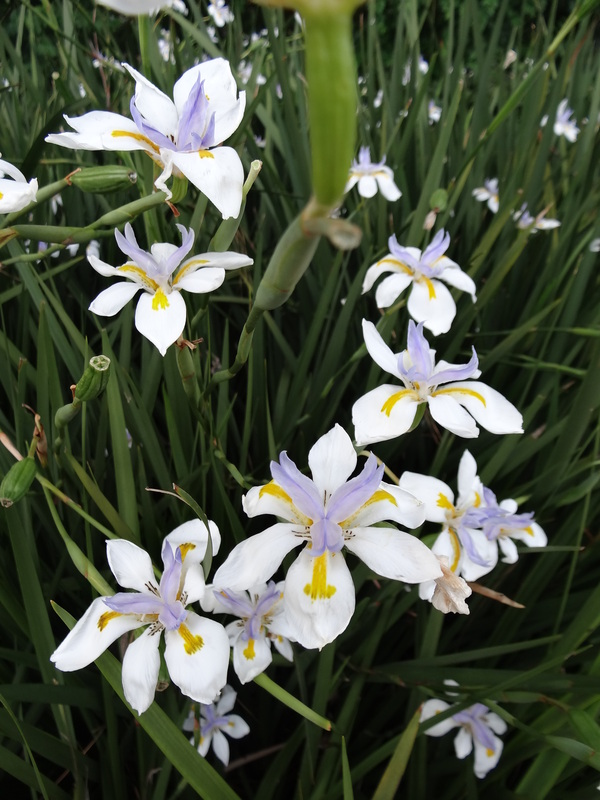 Curiosity led me to a tour of the gardens, designed by well-known South African gardening guru, Keith Kirsten, winner of many gold medals at Chelsea. 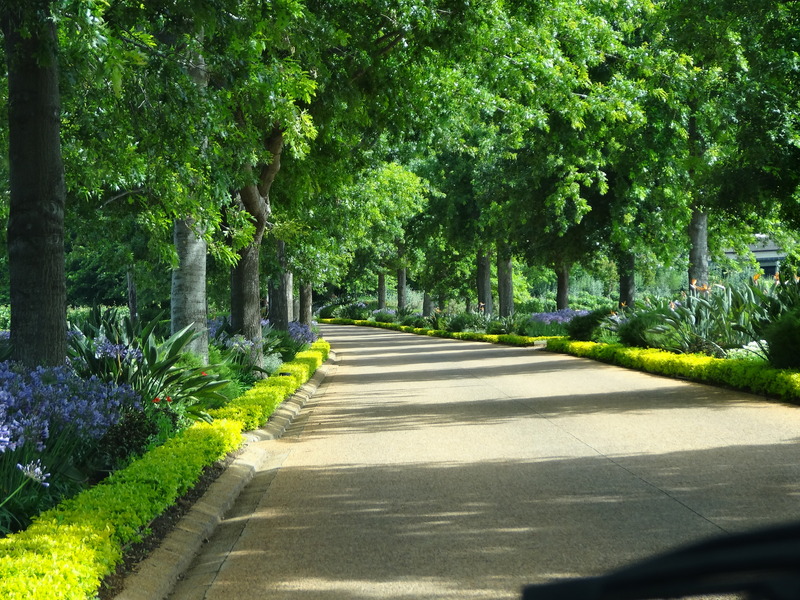 It was clear from the winding drive alone that the standard of planting and maintenance is spectacular. The long drive up the mountainside at Delaire to the top of Helshoogte Pass. 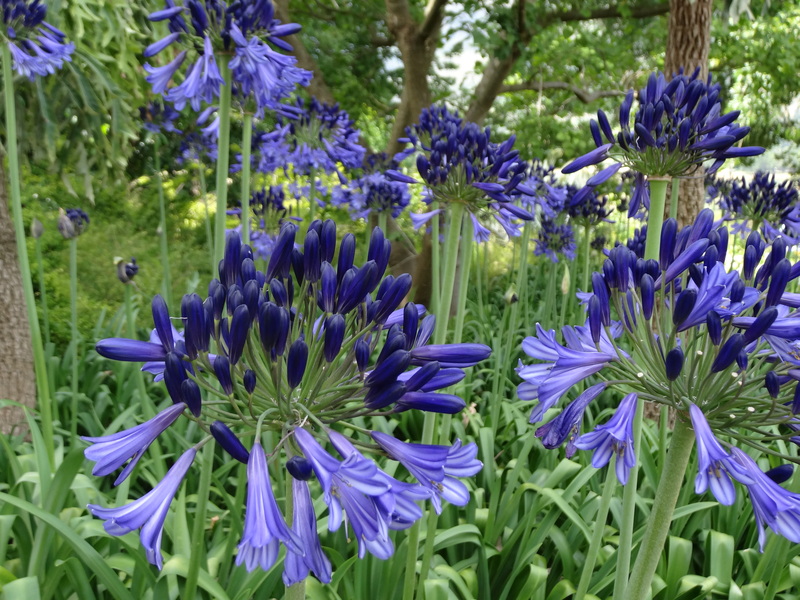 Indigenous plants such as Cycads, Agapanthus, Strelitzias and Dietes grandifolia are massed in vast numbers to give luscious colour 365 days of the year. Over 300, mainly indigenous, trees, plants and shrubs have been planted – milkwoods, yellowwoods and scented hedges of camellias. 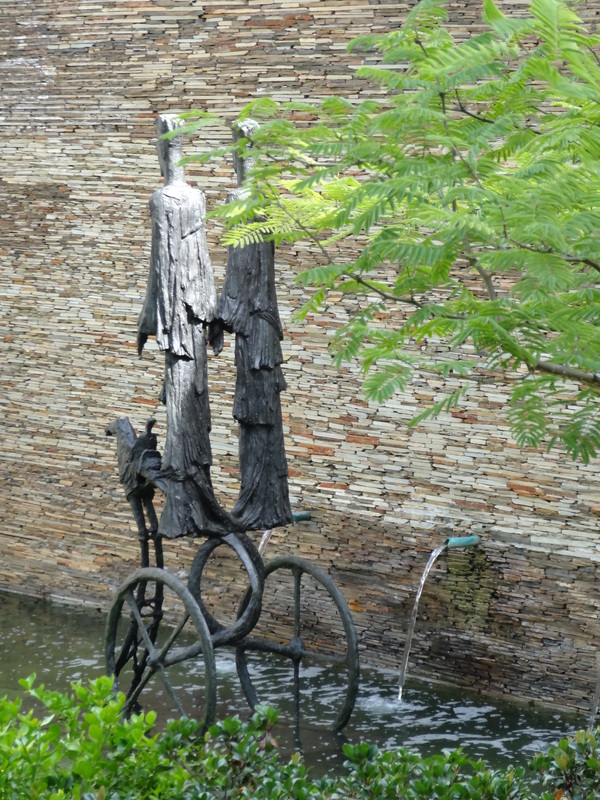 Laurence Graaf may be the “King of Diamonds”, but he is also a well respected art collector and sculptures abound in the garden as well as wonderful paintings throughout the restaurant and Lodge. Rivetted bronze figure by Anton Smit. There are water features, rills and reflective pools, all very welcome in the heat of the African sun. This is a truly luxurious place to stay and breathtakingly pretty for lunch. The vineyards are on some of the best soil in the area, with cooling breezes, and the wines have been winning many awards. 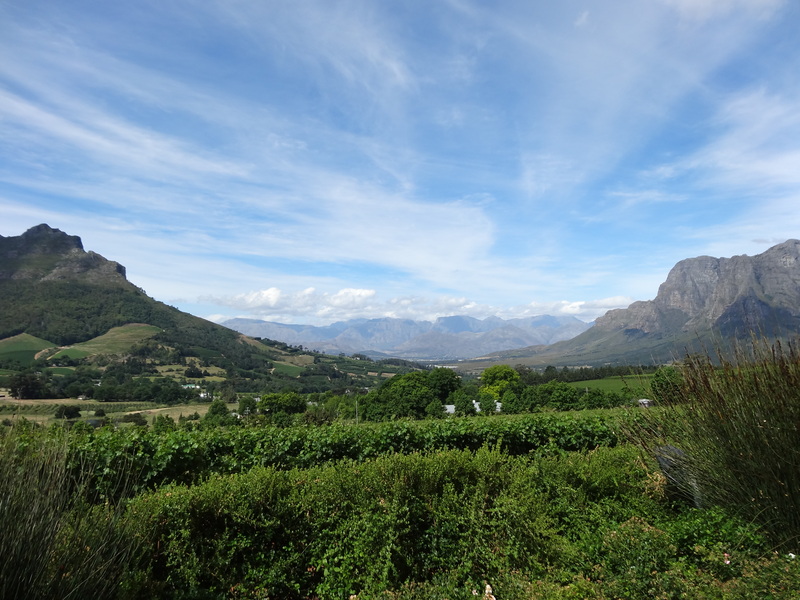 If you are visiting the Cape wine region, try to book a table for lunch or, at the very least, drive up to the reception and gaze at one of the most beautiful views in the Cape region. 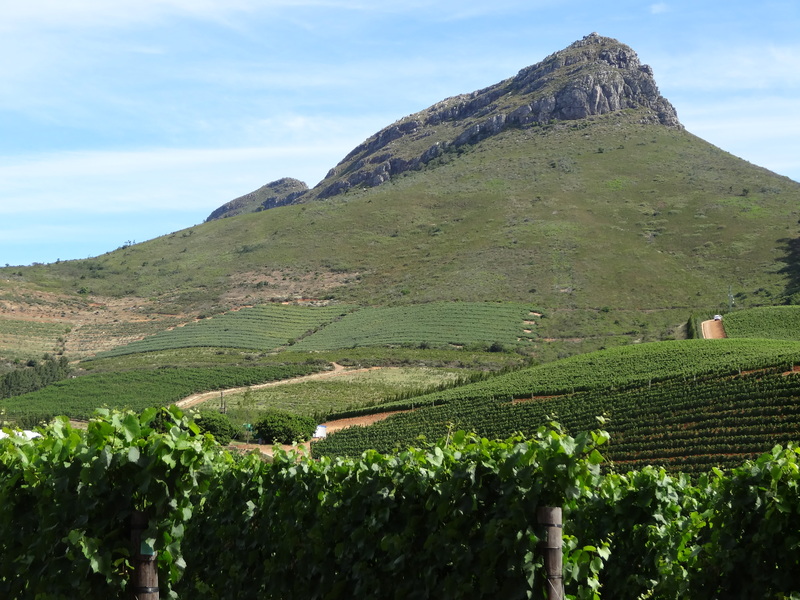 More here : Delaire Graaf wine estate. It is nice to see formal garden using mainly indigenious plants and trees. It looks like an amazing place to visit. Thanks Honey. I do prefer gardens which have evolved over time but the creation of this one in recent years is quite spectacular, especially given its location and, as you say, very glad they largely used indigenous plants. This is absolutely beautiful 😮 so much to take in! Many thanks Gemma, I think the lovely surrounding landscape makes the gardens even more spectacular. I’m often skeptical about the use of ‘realistic’ animal sculpture in a garden, but I think the cheetah works well. It captures the essence of the animal without looking trite. Nicely framed too. This particular cheetah I felt looked good and drew one’s attention to the view. There were others – perhaps a little ott. (It was clear that this was a garden created with a great deal of money). But it was great to see a garden open to the public with such a high standard of maintenance. Wonderful post and photos! Thank you! Many thanks indeed, glad you enjoyed it. The bright African sunshine is a blast of colour on what is a dull grey day here! What a beautiful tour – it is a spectacular location, but that driveway planting is quite amazing! I quite agree – it took my breath away as I drove up to the reception. Really glad you enjoyed the tour. thanks for sharing this if I visit the Cape region I will definitely try to visit. Was the food good? Organic produce from their own gardens and interesting ingredients. Quite pricy but go for the whole ambience too.